My mother used to say, “use a new word ten times and it’s yours”. She applied the same method to teaching me to cook. When I was eight years old, she had me make baking powder biscuits ten times over a couple of weeks, until I mastered them. Many years later, I still remember the recipe and adapt it to all sorts of things. I make them larger and smaller, thicker and thinner. I sometimes add cheese or herbs to the dough (cheddar and dill biscuits are particularly nice). I always save any bacon fat or chicken fat in the fridge, and it makes a delicious biscuit when swapped for the margarine. Rolled thin, the dough makes a good base for a savoury tart, perhaps spread with caramelised onions and rosemary and baked until golden. It can also serve as the topping for a stew. I arrange the biscuits slightly apart on the surface of the stew and then pop it into the oven until they are cooked through. Cut in the margarine until the mixture resembles coarse breadcrumbs. Stir in the milk. Form the dough into a ball and turn onto a floured surface. Knead eight to ten times. 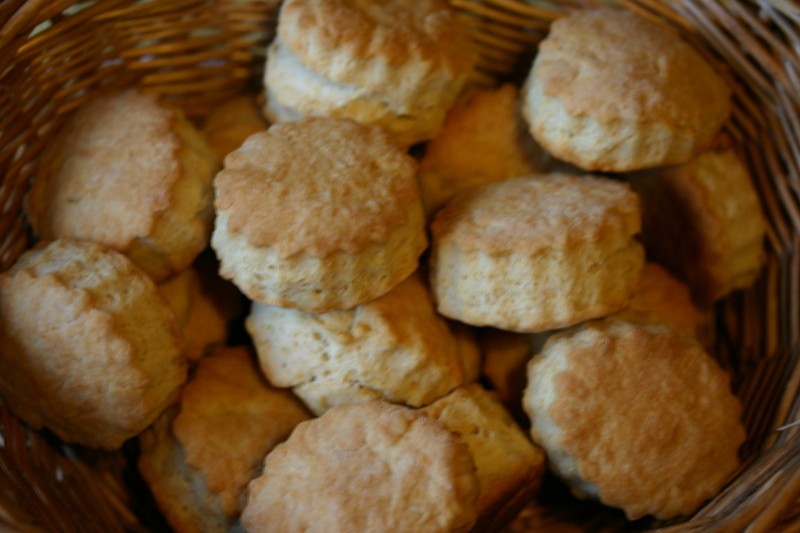 Cut out the biscuits using a cutter approximately 1″ in diameter, and place them an inch apart on an ungreased baking tray. Bake for ten to fifteen minutes until doubled in size and golden. Serve hot.